No matter where they are, they can always have Paris. 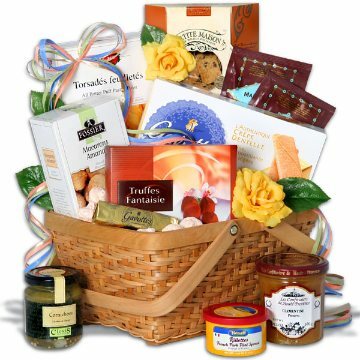 That's because we've united some of the most authentic French delicacies into this beautiful, sophisticated basket. With a wide selection of the most decadent French gourmet foods, including traditional chocolate truffles, crisp almond macaroons, and butter palmiers, this generous offering allows the best of Paris to travel anywhere. This gift includes the following: L' Authentique Crepe Dentelle (in gold foil) by Gavottes - 4.4 oz., Palmiers au Beurre by Fossier - 4.4 oz., Orange Preserves by Les Confituriers de Haute-Provence - 12.3 oz, Chocolatier Truffles Fantaisie by Guyaux Chocolates - 2.8 oz., Almond Macaroons by Biscuits Fossier - 3.5 oz., (2) Marie Belle Aztec Hot Chocolate - 1 oz packets, Roquefort & Walnut Crackers by Biscuiterie de Provence – 2.3 oz, Cornichons in vinegar by Clovis - 370 ml, Pork Pate Spread by Henaff - 3.10 oz.